Please note that crm5 is valid for APAC region. Refer to following article for your valid extension. 3. Click on Test Connection. At this point mention your office 365 Log in credentials. This will update the organization and display name for you. 4. If this is the default organization you want to use with outlook, click the Synchronize with this Organization. 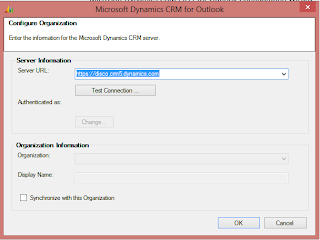 This is it and you are good to use Microsoft Dynamics CRM Outlook client with Microsoft Online Office 365 account. 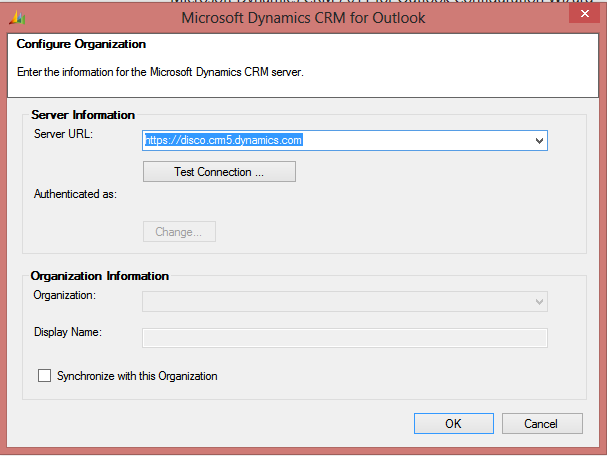 If you chose Cancel for the Microsoft Dynamics CRM for Outlook, that is alright. You can still complete these steps. Simply search for Configuration Wizard which shall bring up Microsoft Dynamics CRM 2011 for Outlook Configuration Wizard. On this window select 'Add' button. This will popup the same window as of step 1. Such a good and helpful information for online crm software Service. Online crm software, Online crm, CRM, sales automation, CRM Products. Thanks For sharing with us and keep share more blogs for us.